Wolf Military Classic 5.45x39 60gr FMJ Ammo, non-corrosive, lacquer coated steel case, berdan primed. 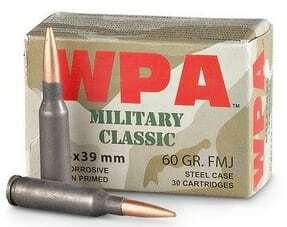 This ammo comes packaged 30 rounds / box with 25 -30 round boxes in a 750 round case. We sell it by the box with a price break at the 25 box ( 750 round case ) quantity.